At some point in the fall of last year (2015) Google changed their technology and it was no longer possible to embed Google Spheres in other websites. That technology changed again in January, from what I understand, and thanks to some very smart people it is again possible to embed a sphere. As it takes a while for my spheres to become a formal Google Maps contribution, it takes a while to embed them in a blog post – but better late than never. Below is a sphere taken at Quarr Abbey, close to Rye on the Isle of Wight. Alex, Thomas and I enjoyed the bicycle ride there from Cowes. The last leg of our 2015 transatlantic tour took us from St Malo, France, via Guernsey (Channel Islands) and Cowes (Isle of Wight, UK) to Germany. The Channel Islands are a destination in their own right and in three days we barely scratched the surface. Taking the ferry to Sark was a great experience and we wished we had more time (and less rain). Sailing across the Channel past the Needles and down the Solent to the sailing mecca, Cowes, was a special experience (especially, when 400 boats participating in the Fastnet Race are going in the opposite direction). On the Isle of Wight we enjoyed our daily exercise riding bikes up and down the rolling hills. Finally pushing off to the final sail took us past the cliffs of Dover, lots wind farms and oil platforms and endless lines of freighters. Going through the locks to get into the Kiel Canal indicated that we were getting close. A large reception with family and friends topped it off before we took Tioga out of the water in Kappeln. All basic repairs are done by now and the more significant work is in progress. The new mast was ordered. The number of chairs squeezed into our clubhouse last night might have broken a record. It was nice so see such as large and interested crowd during our presentation of this year’s journey across the Atlantic. Given the close connection between our tour and the various people and places in France we visited, it was good to listen to Commodore Manny’s opening statements where he found the appropriate words to address the tragedy in Paris. Manny handed over to Philip and we continued with a couple of photos summarizing the highlights of the tour, giving us the opportunity to explain the bigger picture in words and answering questions. Videos for each leg followed, showing live at sea and the various places we visited. The things you can do with a phone these days; time lapse, slow motion etc. Combine that with the good eye of Alex and you get a nice impression of our final leg to Germany. Cowes is an old English word for Castles. There used to be two castles, one in East-Cowes and one on our side West-Cowes, or Cowes (the one in Cowes now houses the “Squadron” – the Royal Yacht Squadron). In addition to a lot of historically relevant places, this beautiful town is a sailor’s dream come true. Lot’s and lot’s of boats, marina’s, yacht clubs, chandleries, supermarkets, pubs, restaurants etc; and all very close together. You can tell that the locals are very proud (and knowledgeable) of their history. The girls met Paul, the Counselor of Cowes, and he shared his wisdom with us over a couple of days. Paul also invited us to his club, the Island Sailing Club, after sending us to the Cowes Corinthian Yacht Club for their weekly Tuesday dinner the night before. Of course, we exchanged burgees with both clubs. The Island Sailinbg Club is rumored to have the largest burgee collection in the world with about 3500 burgees…. it is also the host of the Around the Island regatta which has thousands of boats on the line every year. One of the highlights of our stay in Cowes was the visit by Peggy, Sebastian, Lawrence and Simon. They came over by ferry for an afternoon and it was really nice to catch up with them again. They’ll hopefully meet us next year at the Caledonian Canal again. At the Cowes Corinthian Yacht Club we also met Joy and her friends from Birmingham. Amazing to hear all her stories about the history and famous people of Cowes. One of the highlights that is easily missed is the Sir Max Aitken museum. It is located in a former sail loft and exhibits very interesting artifacts, such as the gaff of Britannia, the crib of Napoleon’s baby, parts of Nelson’s boat etc – one large room; with a huge amount of history. As with any of the previous places where we rented bikes, it was truly worth the effort as we saw a lot of the Isle of Wight (which is a lot larger and hillier than we expected) and also got a decent exercise. Now that Bjoern arrived, the fuel is topped up and the food loaded, it is time to say good bye and make our way to Germany. 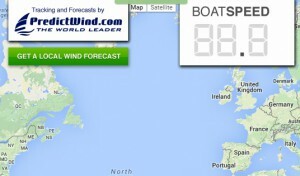 Cowes marks the first half of our final leg to Germany. This is where we change crew for the last time. Candace left the island per ferry on Monday (flying back to Boston via Heathrow) and Alex arrived here on Tuesday (coming in from Hannover via plane, bus and ferry). Bjoern will fly in from Munich on Thursday morning and we are planning to leave here Thursday afternoon (weather permitting). We had a great time in St Malo, the Channel Islands, Lymington and Cowes and already miss Candace and our sitting in the cockpit dance club at the dock in Cowes…. The overnight sail from St Malo was about 60 nm and the daysail from Guernsey to Lymington about 100nm. Both were quite different in nature but quite enjoyable in their own way.